Migrants who had been sent to Latvia from Germany under the European Union (EU) redistribution policy have moved back to Germany almost as soon as they reached the small Baltic nation. After agreeing to take in 531 migrants directly from Germany to process their asylum claims, a new report shows that of the 69 that actually arrived, 23 of them gained asylum, but only two migrants decided to stay in the Baltic state with the rest heading back to Germany, reports Spiegel Online. Latvia is a country in the Baltic region of Northern Europe, one of the three Baltic states. Raimonds Vējonis is the current President of Latvia, in office since 2015. He is a member of the Green Party, part of the Union of Greens and Farmers. In Latvia, President gets elected and appoints Prime Minister. Dana Reizniece-Ozola is the Minister of Finance who had been the Chairperson of the Commission on Education, Culture and Science, Member of the Legal Affairs Commission and Member of the European Affairs Commission. Baku, the capital of Azerbaijan, is also the largest city on the Caspian Sea and of the Caucasus region. Baku is located 28 metres (92 ft) below sea level, which makes it the lowest lying national capital in the world and also the largest city in the world located below sea level. The city is renowned for its harsh winds. This is reflected in the city's nickname, the "City of Winds". The 42nd Chess Olympiad, organised by the Fédération Internationale des Échecs (FIDE) comprises of an open, an women's tournament, as well as several events designed to promote the game of chess, is being held in Baku, Azerbaijan from 1–14 September 2016. It is the first time that the Chess Olympiad has been hosted in Azerbaijan. The total number of participants is 1,587, with 894 in the open and 693 in the women's event. The number of participating teams is 180 from 175 countries in the open section and 142 from 138 countries in the women's section. Eritrea, Kosovo, and South Sudan competed in the tournament for the first time. 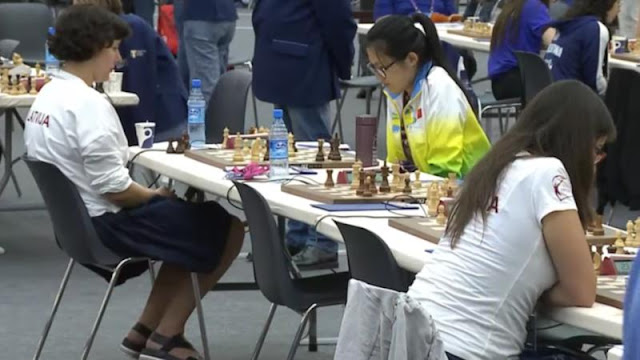 On Monday, Latvia’s Minister of Finance and woman grandmaster (WGM) Dana Reizniece-Ozola stunned World No 1 China’s Hou Yifan in Round 4 at Baku. The 34-year-old, a former junior European champion, took a moment to digest her victory, staring blankly at the board for an instant before cupping her mouth with disbelief. Her victory though was unable to prevent the Latvian women’s team from going down 1.5-2.5 to China. Though the Finance Minister game against the World champion was the biggest attraction and loss, China still emerged on the top with wins of JuWenjun and Guo Qi,” FIDE said in their official post-day press release. Reizniece-Ozola is currently ranked 318th in the world and has an ELO rating of 2,243. She has represented Latvia in seven Olympiads, the first of those coming in 1998 when she was just 17. Chess and politics aren’t the only areas where Reizniece-Ozola has made an impact. She was the project manager for Latvia’s first ever satellite and has degrees in business, law and linguistics. India had mixed fortunes in the round, with the men’s team continuing their perfect start, smashing Cuba 2.5-1.5. P Harikrishna, SP Sethuraman and B Adhiban drew with their opponents, but Vidit Gujrathi clinched the round for India with a win over Yuniesky Quesada Perez. India had earlier defeated Azerbaijan, Costa Rica and Bolivia in their first three rounds. The women’s team fared ordinarily, being held by Israel 2-2. DronavalliHarika and Soumya Swaminathan played out draws but Padmini Rout lost to MarselEfroimski. It was left to Tania Sachdev to rescue India with a win over Masha Klinova. Buoyed by defeating the best woman player in the world, Latvia’s finance minister is to skip a top EU meeting this week to pursue her passion for chess, her spokesman said on Wednesday (8th Sept.). Her ministry confirmed she would not attend a 9th September meeting of EU finance ministers in Bratislava, Slovakia, in order to keep playing chess. “The minister is on vacation and will still be in Baku, so Latvia will be represented by the secretary of state in Bratislava instead,” spokesman told news agencies. For chess fans (Reizniece-Ozola’s) victory is so emotionally pleasing even taking into account the team’s loss,” the federation said on its website.